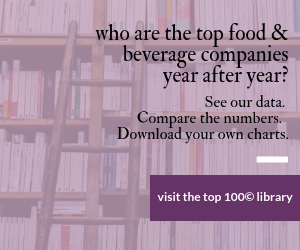 Our annual report on the food and beverage industry's top companies finds that the biggest news is only one company reported a loss in 2010. If you're itching to see the entire list of the top 100, take a look at the interactive version at www.foodprocessing.com/top100. You have access to this year's data (which is sortable by sales, rank, alphabetical order) as well as last year's data (which is also sortable). We try not to make this annual list into any kind of a competition, but there is a new leader atop our Top 100© chart of the largest food and beverage companies in the U.S. and Canada. PepsiCo Inc., which has been No. 2, 3 or 4 on this list in recent years, turned in a good 2010 by most measures, increasing its former core operations, the ones we measure, by 7-9 percent. But its biggest leap up our chart occurred with the February 2010 acquisition of its largest – and independent – bottlers. Pepsi Bottling Group Inc. added $14 billion in sales to the corporation's top line, and PepsiAmericas chipped in another $5 billion. While not all their sales were domestic, the sales (and efficiencies) of both have been so integrated into PepsiCo we cannot separate them out. Fortunately for us, PepsiCo does separate revenues by region. So, adding together PepsiCo Americas Beverages, Frito-Lay North America and Quaker Foods North America, we get our chart-leading $35.6 billion figure. PepsiCo's growth notwithstanding, perhaps the biggest news in this year's table is the number of companies that recorded net losses during 2010: There was only one! Dole Food Co. (No. 17) got caught between lower banana production worldwide and weaker pricing, and the company lost $30 million, even though sales increased by nearly 2 percent. (Only 62 of the companies report net income – the private ones do not.) We haven't had only one company reporting a net loss for the year in at least eight years (and maybe much longer – our figures back then were incomplete). Getting back to PepsiCo, that example illustrates much of the logic and the challenges we encounter each year in making this list. It is a list of the 100 largest food & beverage processors in the U.S. and Canada – not necessarily food marketers or resellers. We don't count products manufactured overseas (although we do count exports); we count only value-added products (not raw milk, produce or eggs); and we count self-manufactured products only, not those made by other food processors and rebranded (although we do count contract manufacturers and private labelers). At least we try. There's an assumed homogeneity across the food industry but, as we pore through annual reports and other documents each year, we realize how every company is different. We make adjustments where we think they're warranted, which means you won't see many of these numbers in any other report. All company sales all over the globe are included in the column "2010 Total Company Sales." And this list represents the most recent fiscal years available for these companies. For most, that means calendar 2010, but several already have reported 2011 fiscal years. For Cargill and ConAgra, fiscal 2011 ended as recently as May. So it wasn't a bad year, although it did come with challenges. PepsiCo Chairman/CEO Indra Nooyi could have been speaking for most of these companies when she wrote in her company's annual report: "Amid the continuing challenge of the most difficult global macroeconomic environment in decades, we delivered strong operating performance that puts us in the top tier in our industry." A weak consumer landscape given the poor macroeconomic picture, especially the high level of unemployment in key developed markets. High levels of cost inflation for the coming year , driven by broad and pronounced commodity inflation. A potentially difficult competitive pricing environment. Her solution: "Differentiated products help us drive sales and pricing. In 2010, we again increased our R&D investments in sweetener technologies, next-generation processing and packaging and nutrition products. For example, SoBe Lifewater Zero Calorie, a product made with an all-natural, zero-calorie sweetener, was a direct result of that investment — the SoBe Lifewater brand grew volume 46 percent in 2010 alone. Similarly, our technology investments allowed us to reduce sodium levels in some of our salty snacks without compromising taste and to use 100 percent recycled PET in our Naked Juice bottles." The PepsiCo chairman/CEO also noted the unique positioning of PepsiCo, and one of its six imperatives for the year. "Our third imperative is to unleash the power of the Power of One. Studies show that, 85 percent of the time, when a person eats a snack, he or she also reaches for a beverage. No company on earth is better positioned to fulfill both sides of that equation." So next year at this time, we'll see how she capitalized on that unique positioning. Last year, the title of this report was "Less is More" – as in lower sales in 2009 somehow translated into higher profits. Fifteen of the top 25 companies on last year's table recorded lower sales in 2009 than they had in 2008, yet 17 of those 25 improved their bottom lines. This year, both those measures are up. Nineteen of the top 25 companies increased sales in 2010, and 18 of them also improved profitability. For the whole group, 63 of the 100 had higher sales in their latest fiscal year, and 40 also upped their net incomes; 22 went down in income (we have a lot of private companies who don't report to us their income – it's hard enough getting them to report sales). The biggest sales increase in dollars belonged to PepsiCo, thanks to those acquisitions. Percentage-wise, the biggest increase was recorded by No. 67 AdvancePierre Foods – up 117 percent. Why? Because a year earlier it didn't exist. Pierre Foods, with sales of about $600 million, languished in Chapter 11 bankruptcy protection until its investors merged it last September with Advance Foods and some other properties to create a $1.3 billion company. The new company is owned by funds managed by Oaktree Capital Management LP, current Advance shareholders and members of the company's leadership team. Imperial Sugar Co. (No. 81) sales shot up 74 percent, largely because its Port Wentworth, Ga., refinery came back on line, after that 2008 explosion. But sales also were helped by three interesting joint ventures – with PureCircle to blend sugar and stevia; with Edward Billingtons & Sons to market agave; and with Cargill Inc. and Sugar Growers & Refiners Inc. to build a new refinery in Gramercy, La. No. 42 Pinnacle Foods also jumped, up 48 percent, largely due to its billion-dollar 2010 acquisition of former No. 78 Birdseye Foods. No. 6 JBS USA, which just burst on the North American scene in 2007 with its acquisition of Swift & Co., grew another 21 percent, thanks in part to its purchase of Smithfield Beef Group (the Dept. of Justice blocked its proposed acquisition of National Beef Packing Co.). Smucker and Ralcorp both added about $200 million in sales due to acquisitions. Hormel Foods recorded 11 percent sales growth largely on organic (the business term, not the agricultural term) growth. The vagaries of milk pricing and that market continue to vex No. 8 Dean Foods. In 2010, its sales were up but profits were down. In 2009, just the opposite occurred. "In 2010, we experienced the most difficult year in Dean Foods history," Chairman/CEO Gregg Engles wrote in his annual report. "While we have remained a profitable company, the financial pressures that began impacting our core dairy business in late 2009 continued throughout the year and into 2011. Margins on private label milk declined significantly." The former stockbroker wanted to create a national, branded dairy when he began acquiring dairy companies in the 1990s, but his company's output remains 56 percent private label. A couple companies returned to profitability in 2010 after sinking into red ink in 2009. Tyson Foods (No. 4) turned a $551 million loss into a $765 million profit. "We produced record sales and earnings despite some market headwinds," President/CEO Donnie Smith said (a lot of CEOs used the term "headwinds" this year). "We're just over halfway through our first quarter of fiscal 2011, and it is shaping up to be a strong quarter and another good year. There are always challenging market conditions to manage." Smithfield Foods (No. 10), another animal protein supplier, did similarly. Ditto for No. 18 Pilgrim's Pride, which emerged from bankruptcy protection in 2009, thanks to a 67 percent buy-in by JBS. In addition to AdvancePierre Foods, we have a couple of new names on this year's list. Diamond Foods debuts, at No. 93, with a bullet. Once a sleepy walnut cooperative, the company developed its own brand (Emerald) of nut snacks, then bought Pop Secret popcorn from General Mills in 2008 and Kettle Foods potato chips in early 2010. Next year it will rocket up the list, hitting an estimated $2.4 billion in sales, having bought Pringles from Procter & Gamble. The core of companies and brands that comprised National Dairy Holdings hasn't changed, but the name has. National Dairy was acquired by Mexico's largest dairy company, Lala, in mid-2009, and used the name Lala USA last year. Just this summer, Lala said it's changing that name to reflect its leading brand, a venerable old name in the food industry. So Borden Dairy appears at No. 43. It's going to be tougher to get figures from two of these companies next year. Michael Foods (No. 63) went private in June of 2010. And on March 8 of this year, Del Monte Foods (No. 31) was acquired by an investor group led by funds affiliated with Kohlberg Kravis Roberts & Co., Vestar Capital Partners and Centerview Partners. And as earlier noted, Birds Eye Foods is gone, now a part of Pinnacle.